Our journey to pregnancy has always been a joint effort shared between my husband and me. So I couldn't imagine celebrating this exciting milestone without him. Here are the details on our co-ed baby shower. From the beginning, my husband and I knew that we wanted to throw a co-ed baby shower. It seems silly and outdated to exclude men from this exciting milestone. It took both of us to make this baby and it’s going to take both of us to raise this baby – so why should only one of us bask in all of the lovely gifts and support from our community? Moreover, why shouldn’t men be able to celebrate this special event and transition into parenthood just as openly and joyously as women? On June 23rd, just shy of 32-weeks of pregnancy, we threw a co-ed baby shower that included all of our family and friends. No “princess-erizing” the mom, no over-the-top gender themes, no hours upon hours of opening gifts – just some good food, some fun cocktails, and some really special moments with the people we love the most. Photos and details below. Venue & Catering: My husband and I live on the water in Brooklyn with direct views of the Manhattan skyline and all the boats that float up and down the East River. I really wanted to incorporate these great views into the baby shower and thus the venue Giando on the Water felt like the perfect fit. Positioned directly on the East River in Williamsburg, Brooklyn, it offers sweeping views of the water, the city, and all three world-famous bridges. I also loved that it could easily accommodate all of our family and friends in an upscale setting, it catered a delicious four-course lunch with special cocktails, and it offered its very own event planner. Vendor: Giando on the Water in Brooklyn. Theme & Decorations: My husband and I love to sail and since we’re having a summer baby, a sailboat theme felt perfect. Since our venue offered such amazing natural views, we didn’t feel the need to overdecorate, but rather incorporated a few sailboat elements throughout, including an anchor themed cake, baby boy “sailor suit” cookies, and flower arrangements peppered with tiny anchors and boats. We rounded out the sailboat theme with pops of gold glitter “Oh Baby!” banners, cocktail napkins, confetti and large helium letter balloons for the gift table. Cookies & Cake: After much research, I found a local Brooklyn bakery that custom designs cookies and cakes into anything you wish. The sky really is the limit with these guys and I was very impressed by their attention to detail and ability to replicate anything. We decided on a three-tiered chocolate mousse cake with anchor and nautical rope design. As party favors, we ordered sugar cookies in a baby boy “sailor suit” theme with a “Thank You For Coming” customized note. 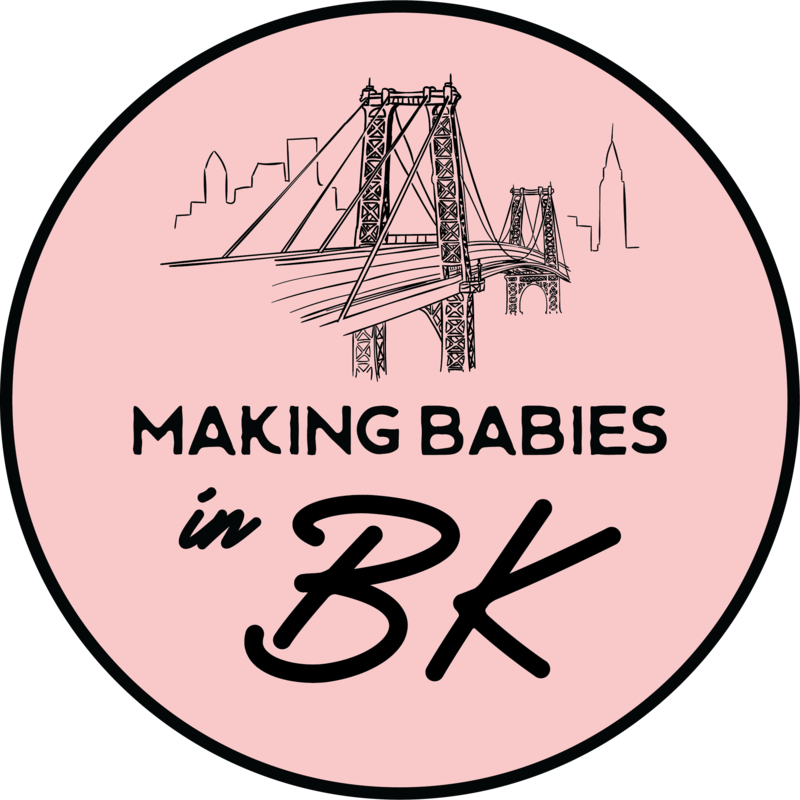 It was important to me to represent the Making Babies in Brooklyn platform, since not only is fertility and IVF such an important and underrepresented topic, it’s also the reason for this baby shower! I also customized and designed cards to go with each cookie.